Cameron's Compression Systems in Buffalo, NY, is a leading worldwide provider of integrally geared centrifugal compressors. The company, which has been in the business for more than 50 years, designs and manufactures highly customized centrifugal compressors for air separation and process gas businesses worldwide. In this highly competitive market, Cameron's Compression Systems constantly strives to deliver to its customers the best value for their money. Although state-of-the-art centrifugal compressors are already highly efficient machines as they utilize advanced design principles developed over the past few decades, there always has been an ever increasing demand for even more efficient and sophisticated machines due to high energy prices. This necessitates a further optimization of the centrifugal components (i.e. impellers, diffusers and volutes) to improve overall aerodynamic performance of the centrifugal stages. The advanced use of computational fluid dynamics (CFD) to accurately simulate extremely complex flows in the centrifugal stages has now become a mandatory tool for aerodynamic designs of centrifugal compressors, as well as for development of new technology that may potentially lead to next-generation centrifugal machines. Cameron has been utilizing CD-adapco's STAR-CCM+ for CFD analyses of centrifugal stages for production machines and advanced technology development for the past six years. Since the quality of CFD analyses heavily relies on the underlying mesh quality, the mesh generation tools must be capable of providing an aerodynamic engineer with the high quality meshes for inlets, impellers, diffusers and volutes suitable for the entire range of practical applications. Moreover, the mesh generation process should be robust and allow for automation in order to eliminate possible errors and to reduce the design turnaround times. Cameron engineers have evaluated several commercially available meshing tools, and have come to the conclusion that Pointwise is the best fit for their current and future needs due to its inherent versatility and flexibility. During the past two years, Pointwise has become one of the key tools for aerodynamic design of centrifugal stages at Cameron's Compression Systems. Pointwise is now an invaluable tool for design of novel high performing diffusers for centrifugal machines, including sculpted vane diffusers with partial height vanes (Figure 1) and non-periodic diffusers (Figure 2). With the very strict deadlines, the easy-to-use capability of Pointwise allowed Cameron aerodynamic engineers to consider designs of several diffuser vane geometries with complete flange-to-flange CFD analyses of 3D unsteady turbulent flows in the centrifugal stages (Figure 3). It was even more rewarding when the computationally predicted improvement of the aerodynamic performance for these diffusers was experimentally confirmed on the test stand. Now, these high performance diffusers are routinely utilized for production centrifugal machines, giving Cameron's customers an edge over the competition. Figure 1: Sculpted centrifugal diffuser with partial height vanes. Figure 2: Non-periodic diffuser with full height sculpted blades. Side view of impeller, diffuser, volute and exit conical diffuser. Figure 3: Snapshot of instantaneous pressure contours on impeller and diffuser blade surface. Results are due to Star-CCM+ analyses. Pointwise has established itself as the world-leading mesh generation software for CFD analyses. However, the flexibility and versatility of this meshing software should also make it very attractive and powerful tool for generating finite element meshes for structural and modal analyses. There have been just a few reports on using Pointwise for finite element mesh generations, and structural analysts fail to recognize the potential of Pointwise for their applications. Recently, engineers at Cameron's Compression Systems have extended Pointwise for an automated finite element generation for centrifugal impeller blades. 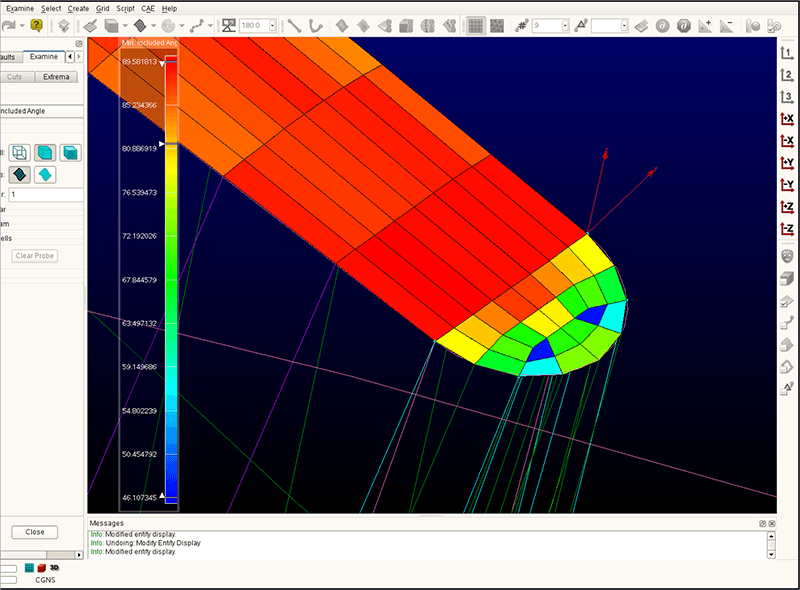 IMPRO, meshing software for blade structural and modal analyses used at Cameron's Compression Systems, has numerous limitations and produces a mesh of relatively low quality. Over the past few months, Cameron's Compression Systems have developed Pointwise-based tools to facilitate automatic mesh generation for structural and modal analysis of centrifugal impellers (Figure 4). The tools include C++-based pre- and post-processors that are wrapped around Pointwise's Glyph scripting language for automated meshing of the impellers. 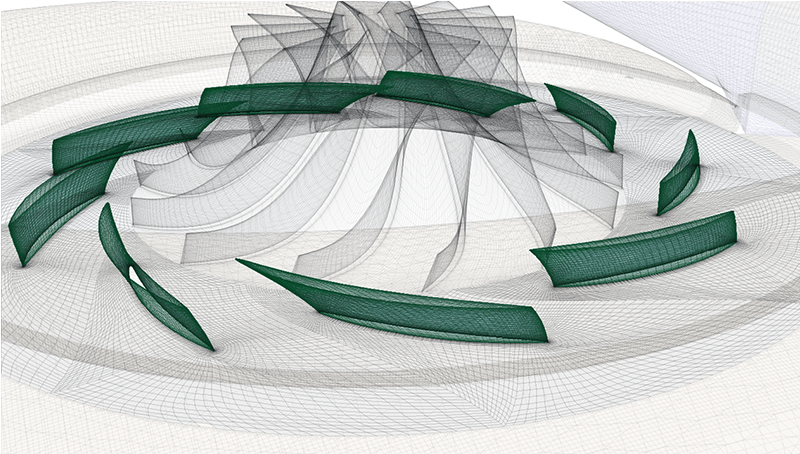 The C++ preprocessor prepares the impeller geometry for import into Pointwise. 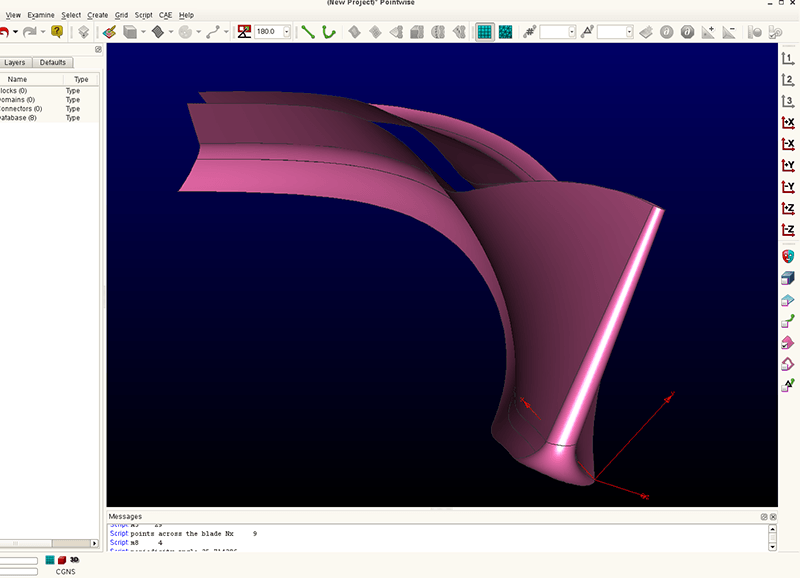 Then the Pointwise script generates a fully structured mesh of hexahedral elements that involves every detailed feature of the centrifugal impeller (Figure 5), including the leading edge (Figure 6), variable fillets on pressure and suction sides, bore chamfer and/or bore fillet (Figure 7), and a sculpted back-plate. 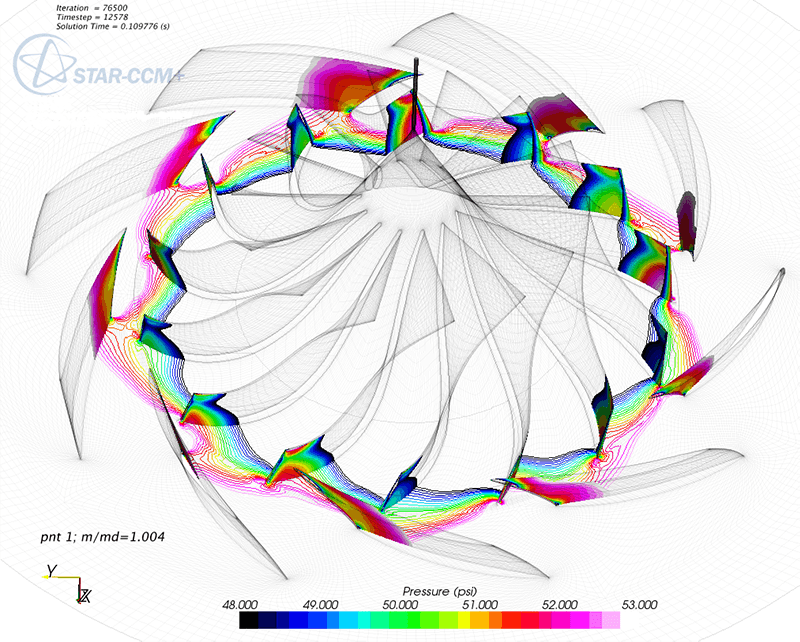 The impeller mesh then is exported as a Star-CD CAE model that features nodal points, element connectivity and boundaries. The C++ postprocessor then imports the mesh and prepares an ANSYS input file that involves entire mesh data, material properties, and defines the boundary conditions with applied load and specifies the analysis type. Although the current CAE model facilitates only 8-noded linear brick elements, it is possible to utilize higher order isoparametric elements with some modifications in the Pointwise script. 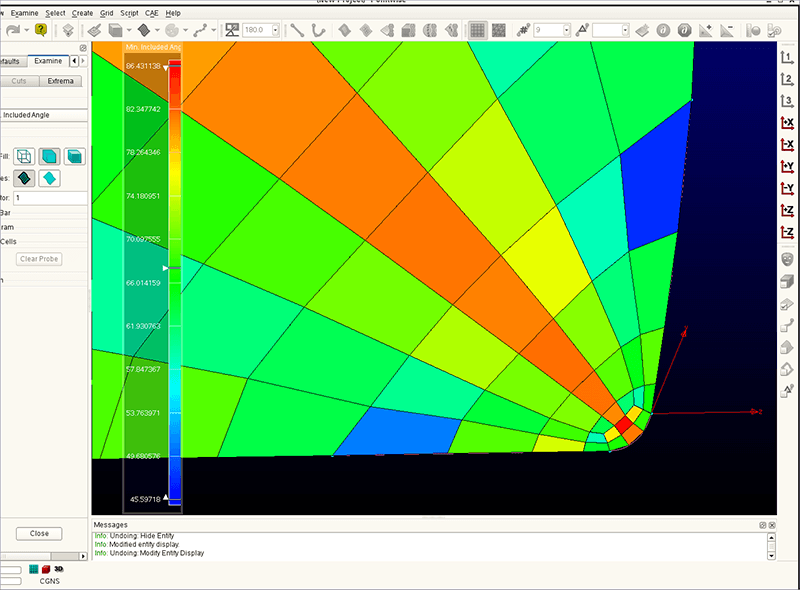 The ANSYS input file could then be executed to perform structural and/or modal analyses. 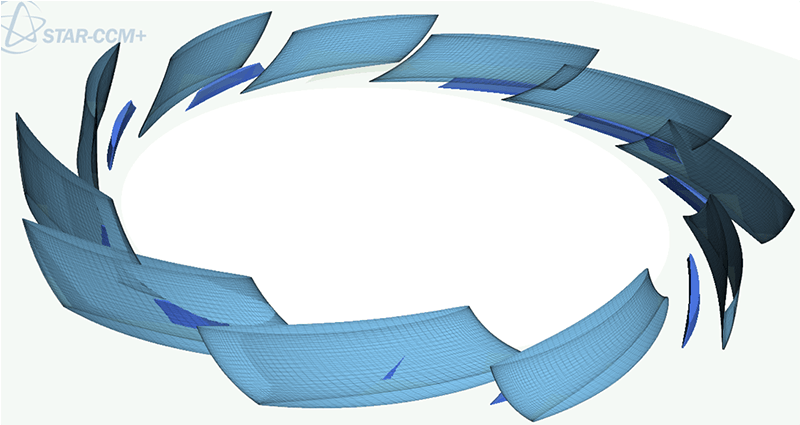 Figure 4: A surface model of the centrifugal impeller blade with fillets on pressure and suction sides. Figure 5: Surface mesh for the centrifugal impeller blade. Figure 6: Mesh topology for the rounded leading edge. View on the top of the meshed impeller blade. Figure 7: Mesh topology for the impeller periodic boundary with the rounded bore fillet at the backplate. The development of Pointwise-based meshing tools at Cameron's Compression Systems has once again highlighted distinctive advantages of Pointwise over the other commercially available mesh generators. First, Pointwise generally targeted for CFD engineers and researchers, turns out to be a very good meshing tool even for finite-element analysis. Pointwise could potentially be a Swiss Army knife for meshing. 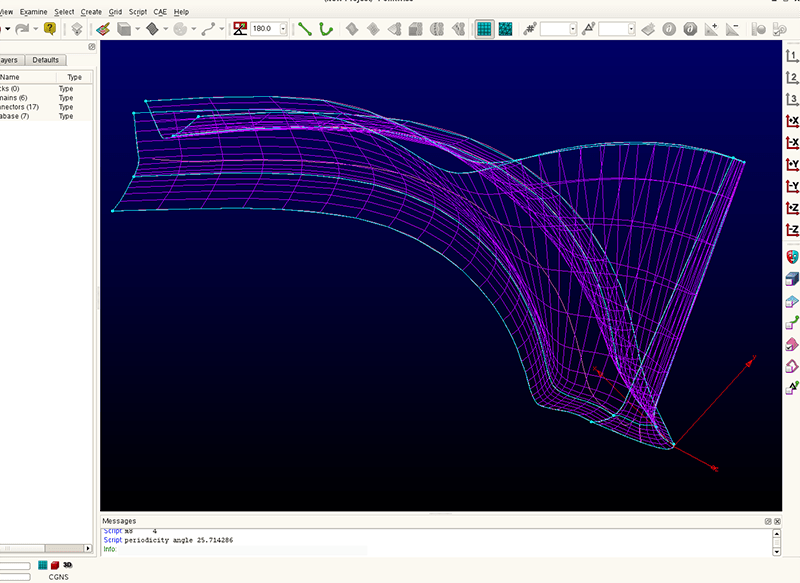 Next, the flexibility and versatility of Pointwise, particularly its scripting capabilities, allowed Cameron engineers to get up to speed in a matter of days with no prior experience with Glyph. Although writing a script to automate meshing is no easy task itself, we would like to emphasize that in the end the Pointwise script turned out to be very general and robust for the entire range of impellers designed at Cameron. Finally, the user-friendliness of Pointwise made the scripting process easier. Generally, debugging a large code is a very tedious and nerve-wracking process; however, the Glyph script debugging process in Pointwise is relatively straightforward provided that the user has had some previous coding experience in other languages. Obviously, Glyph is an extremely powerful language when it comes to automation and it definitely offers much more than the user could get from just the GUI menus. Cameron's engineers have utilized their Pointwise-based finite element tool for structural and modal analyses of regular ruled mean surface impellers (Figure 8). They were able to identify the root cause of high frequency resonance failures of impellers that occurred while operating in the field. This was not possible using the modal analyses that rely on current IMPRO-based meshes. Also, the Cameron engineers have used the Pointwise-based meshing tool to develop and design a new sculpted impeller that shows a significant improvement over regular ruled mean surface impellers (Figure 9). 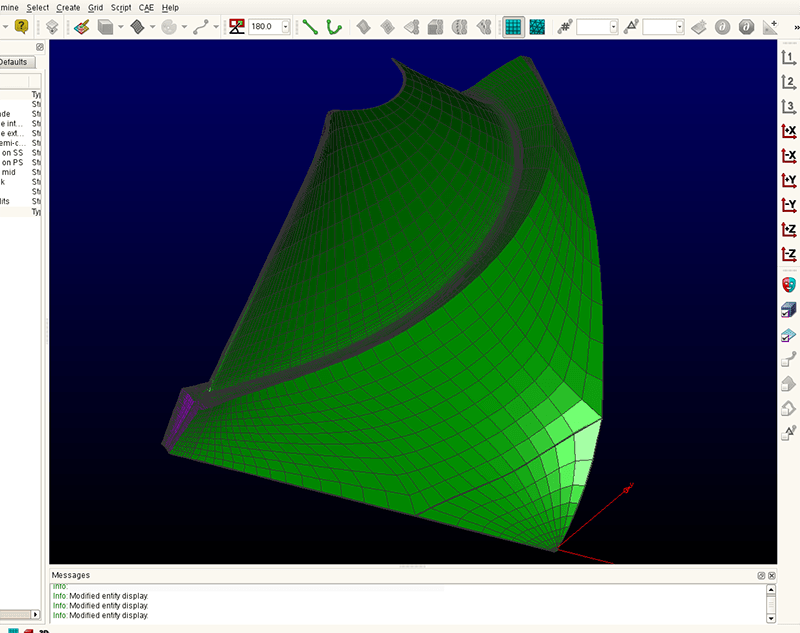 Figure 8: Pointwise mesh for a regular ruled mean surface impeller. Shown is a single impeller segment with the periodic boundaries for the impeller hub. 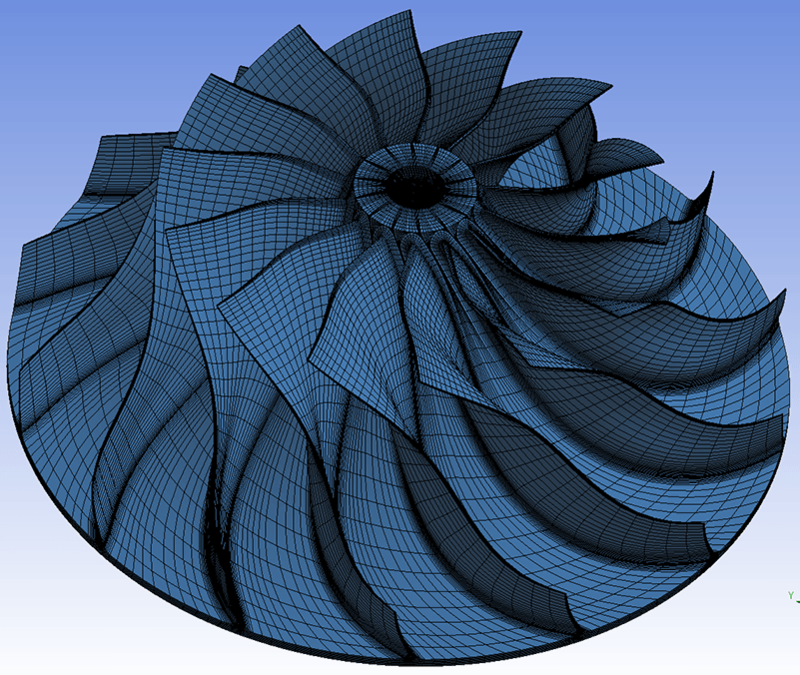 Figure 9: Sculpted impeller designed with the Pointwise-based meshing tool.